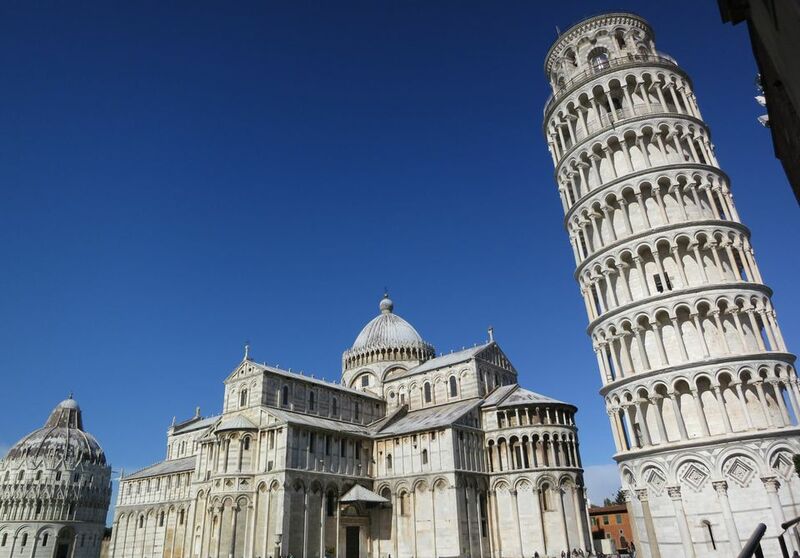 The city of Pisa, located in northern Tuscany approximately 50 miles west of Florence, is home to the iconic 13th-century Leaning Tower of Pisa (pronounced peez-ah, not pizza). The famously lopsided tower is one of Italy's top attractions, drawing millions of visitors each year to marvel at its fascinating, if failed, engineering and its glorious architecture. You'll find the Leaning Tower of Pisa, along with the Duomo (cathedral) and Battistero (baptistery) on the Piazza del Duomo or, as it's more commonly called, the Campo dei Miracoli (field of miracles). Construction began in the 12th century on the bell tower, or campanile, of the Duomo. The white marble, cylindrically shaped tower is decorated in Arabic-inspired geometric patterns and, along with the other three buildings on the site, is considered to be the finest example of Romanesque architecture in all of Tuscany. It took more than 200 years to complete the tower, but the leaning started long before the last stone was laid. Because of the soft ground underneath and the lack of an adequate foundation, the tower began leaning even before builders had completed the third story. To compensate for the tilting and uneven weight distribution, designers in the 13th century made successive floors taller on one side than the other – so the tower actually has a slight curve to it. Yet for 800 years, it continued to fall at the rate of almost two millimeters a year until the heavy bells were removed, and it was anchored into the ground. Today, engineers have deemed the tower safe and stable and say that it has finally stopped moving. Climb to the top of the tower. After a staff member presents you with a brief history of the tower and some fun facts, you'll begin your ascent up the 297 steps of the spiral staircase. The tower has eight levels and is 184 feet (56 meters) tall. Six of the levels are open galleries, meaning they offer wonderful views of the city and the surrounding countryside. Visit the Duomo and museum. Impressive with its striking four-tiered facade, white colonnades and arcades, the Duomo's exterior features grandiose bronze-paneled doors containing bas-relief casts by Bonanno Pisano. The Portale di San Ranieri is especially breathtaking. Inside the cathedral, you'll find a 14th-century pulpit carved out of marble, a tomb by Tino da Camaino that holds the remains of Emperor Henry VII (of the Holy Roman Empire), and a splendid mosaic of Christ in Majesty in the apse. Go inside the Baptistery (Battistero). Begun in 1152, the circular baptistery took several centuries to complete due to periodic lack of funds – mostly when Pisa was at war with neighboring city-states such as Florence and Siena. The baptistery was built in an ornate Gothic style and is known for its astonishing acoustics. Pillars holding up the hexagonal pulpit feature crouching lions thought to represent the Virtues. The marble inlaid octagonal font by Guido da Como was erected in 1246. Other elements to admire within the baptistery are Nicola and Giovanni Pisano's carved pulpit reliefs depicting, among other things, the Nativity, the Adoration of the Magi, the Crucifixion of Christ, and the Last Judgment. Notice the interior's white and grey striping – this was a common motif that you'll see in other Italian cathedrals of the same period, notably at Siena and Orvieto. Walk around the Camposanto (cemetery). Though it's often overlooked by visitors, the Camposanto, or graveyard, is well worth a visit. The long building contains a central lawn and is lined by covered arcades, which are filled with the gravestones and funerary monuments of Pisa's Renaissance aristocracy. The portico once held medieval frescoes and Roman relics, most of which were destroyed or badly damaged during WWII. Visit the Sinopie Museum. Housed in a former hospital, this museum contains the sinopias, or the original parchment drawings that were once behind the frescoes of the Camposanto. When the Camposanto was damaged during WWII and the murals largely destroyed, these sketches were found on the walls behind them, and carefully preserved. Admission: Visits to the Tower costs €18 and can be reserved up to 20 days in advance through the official website for the ​Campo dei Miracoli attractions. Entrance to the Duomo is free at all times. Prices to visit the other monuments and museums are based on how many you wish to visit, as follows: €5 for one; €7 for two, and €8 for three. Note that tickets to the Leaning Tower should absolutely be purchased in advance. Entry is limited and via a timed ticket, so it's highly unlikely that you will be able to just walk up and buy a ticket for the same day. Hours: Campo dei Miracoli: Open daily. Closed January 1 and December 25. Tower: Open daily 8am-8pm (times may vary due to special events); Duomo: Open daily 10am-8pm (open only in the afternoons on Sundays); Baptistry: Open daily 8am-8pm; The Camposanto (cemetery): Open daily 8am-10pm; Opera del Duomo Museum: Daily 8am-8pm. Note: Admission is free to all buildings for visitors with disabilities and one companion, as well as for children 10 and under. The​ Orto Botanico is one of Europe’s oldest botanical gardens, and a nice, uncrowded place to spend some time. Piazza dei Cavalieri sits on the north side of Pisa's Palazzo dei Cavalieri. Today, it's the home of one of Italy's prestigious universities, but once served as the headquarters of the Calvalieri di Stanto Stefano—hence its name.